Sink Your Teeth Into This! 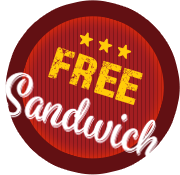 Join the Famous Nation and get a FREE sandwich on your next visit. Our email subscribers enjoy birthday treats, special deals and great stories just for signing up. The contents of this webpage are Copyright © 2019 Blue Ribbon Restaurants-Novi, LLC. A franchisee of Famous Dave's of America. All Rights Reserved.